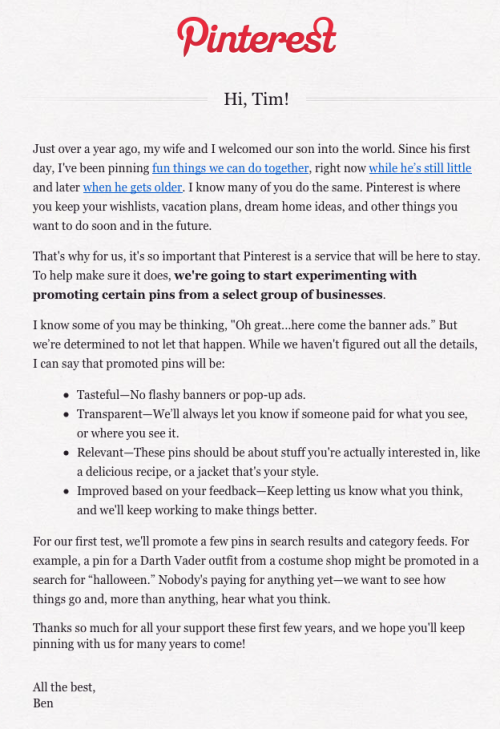 Last week I received an email from Pinterest’s CEO, Ben Silbermann. So did millions of other people. After reading said email, I was inspired to write about it. I’m guessing millions of other people weren’t similarly inspired, so I’ll do my part in sharing what I think is a great example of communications, from which other companies can learn. What’s so special about this email? It’s human — he leads off by introducing us to his family. It’s engaging — those links lead to his personal Pinterest account, where you find pics of his [super cute!] kid and a cool video that you might even re-pin. It’s multifunctional — he demos the product, by showing us his own pins; he establishes a value proposition; he subliminally reactivates us as users. It’s honest — businesses have to make money to survive; Pinterest is not the exception. He recognizes a reality that we can all accept as truth. It’s proactive — he predicts (quite accurately, in most cases) the reactions that we’ll have, and he addresses them before we can even react. It’s transparent — he tells us what to expect in the immediate future, by explaining how they’ll execute going forward. It’s collaborative — he invites feedback and ensures us that our ideas will be heard and taken into consideration. It’s simple — you can read its entirety in 2 minutes or get the most important point within 5 seconds, by reading the bolded words. The next time you communicate with your community, integrate these nine principals into the message. I betcha you’ll be perceived as a darn good person and garner the trust of your audience.